Reprocessing is important part of the medical device life cycle, in both developed and developing countries globally. Reprocessing of medical devices is a method of cleaning, testing, disinfecting, remanufacturing, sterilizing, packaging and labeling of a used, expired, and undamaged medical device in order to make it patient-ready and significantly reduced cost. Reprocessing of medical devices in emerging nations is focused on reducing cost of hospital supply, which leads to compromisation with the safety of patients. According to the report by Transparency Market Research (TMR), the global reprocessed medical devices market registered the revenue of about US$982.7 mn in 2015 and is expected to expand at a CAGR of 14.9 % over the forecast period from 2016 and 2024 to attain the value of around US$3.35 bn by the end of 2024. The introduction of guidelines by the FDA, medical device reprocessing has experienced increase in adoption gradually across the globe. Thus, most hospitals and healthcare facilities outsource medical device reprocessing to qualified third party service providers. The reprocessed medical devices market is segmented on the basis of the type and region. Based on device type, the reprocessed medical devices market is segmented into orthopedic external fixation devices, gastroenterology biopsy forceps, general surgery medical devices, laparoscopic medical devices, and cardiovascular medical devices. Of these, the reprocessed cardiovascular medical devices segment accounted for the dominant share of 61.2% in 2016. This growth of the segment is attributable to the reduced pricing of the products and high usage coupled with growing pressure to reduce healthcare expenditure among hospital authorities. Additionally, increased focus on protecting the environment by reducing medical waste being dumped in landfills is significantly contributing to the growth of the segment. The cardiovascular devices segment has been further sub-categorized into cardiac stabilization and positioning devices, blood pressure cuffs/tourniquet cuffs, deep vein thrombosis (DVT) compression sleeves, diagnostic electrophysiology catheters and electrophysiology (EP) cables. On the basis of region, the global urinary catheters market is segmented in to North America, Asia Pacific, Europe, the Middle East and Africa (MEA), and South America. Of these, North America accounted for the larger share in the market for reprocessed medical devices in 2016. This growth is attributable to the encouraging regulatory policies and increased use of reprocessed medical devices across the healthcare sector. Moreover, reduced pricing and improved quality of reprocessed medical devices are some of the additional factors driving the growth of the market. Some of the key players operating in the global reprocessed medical devices market includes Centurion Medical Products Corporation, Medline ReNewal, Hygia Health Services, Inc., MidWest Reprocessing Center, Ethicon, Inc. (Johnson & Johnson), ReNu Medical, Inc., Stryker Sustainability Solutions, Inc., Vanguard AG, and SureTek Medical. Reprocessing of medical devices refers to the process of inspecting, cleaning, testing, sterilizing and packaging of used and expired medical devices, such that the devices remain effective and safe for suitable clinical application. This study provides the market analysis for various classes and sub-classes of medical devices used for reprocessing. The stakeholders of this report include original equipment manufacturing companies and companies involved in medical device reprocessing and distribution of reprocessed devices as well as new entrants. The market overview section of the report analyzes the market dynamics and trends such as drivers, restraints and opportunities that would affect the current and future scenario of the reprocessed medical devices market. Porter’s five forces analysis is included in this study to provide thorough analysis about the competitive status of the current reprocessing industry, and market attractiveness analysis has been added to describe the market outlook in different geographies. Value chain analysis of the market is discussed in this section to recognize value-creating activities from a number of processes, which would provide an overall understanding of the science of medical device reprocessing. 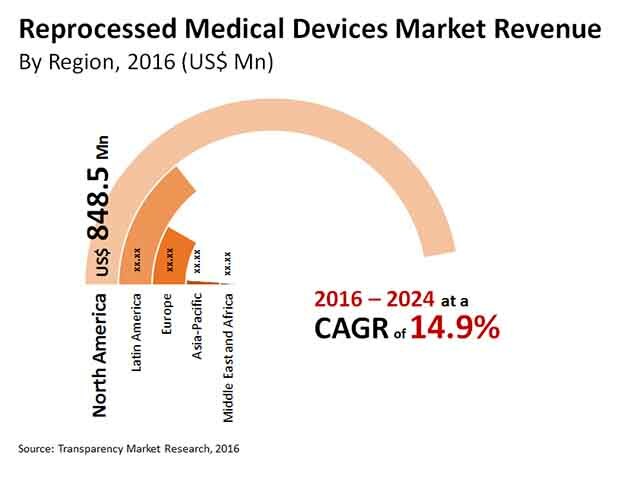 This market study on reprocessed medical devices has been classified based on various types of devices, which are generally used for reprocessing such as cardiovascular devices, general surgery devices, laparoscopic devices, orthopedic devices and gastroenterology devices. Furthermore, for estimating the overall reprocessed medical devices market, each of the major classes mentioned above have been categorized into several sub-classes of reprocessable medical devices. Cardiovascular devices have been segmented into blood pressure cuffs/tourniquet cuffs, diagnostic electrophysiology catheters, electrophysiology cables, cardiac stabilization and positioning devices. General surgery devices have been segmented into balloon inflation devices and infusion pressure bags. Likewise, laparoscopic devices have been segmented into endoscopic trocars and components as well as harmonic scalpel. Orthopedic external fixation devices have been considered for estimating the market of reprocessed orthopedic devices and biopsy forceps have been considered under gastroenterology devices. Market revenue for reprocessed medical devices as well as total devices has been provided in the report for the period 2014 to 2024 in terms of US$ million, along with CAGR for the forecast period 2016 to 2024, considering 2015 as the base year. In addition, volume data for each of these devices is provided in the report from 2014 to 2024, with a forecast period from 2016 to 2024. From the geographical perspective, the global reprocessed medical devices market has been segmented into five major regions: North America, Europe, Asia-Pacific, Latin America and Middle East & Africa. The market revenue of reprocessed medical devices for each geographical market for 2014 and 2024 along with forecast from 2016 to 2024 in respective regions in terms of US$ million, value share and volume (number of units), respectively has been explained in the geography section of the report. The report provides company profiles of major players operating in the reprocessed medical devices market. Additionally, detailed market share analysis of the leading players has been provided which includes companies such as Centurion Medical Products Corporation, Hygia Health Services, Inc., Medline Industries, Inc., MidWest Reprocessing Center, ReNu Medical, Inc., Ethicon, Inc. (SterilMed, Inc.), Stryker Sustainability Solutions, Inc., SureTek Medical, VANGUARD AG., Pioneer Medical Devices AG, The elaborated market share analysis of the companies involved in the market would help new business participants to identify product portfolio of the established companies and understand the business strategies followed by major companies for sustaining in the market.